Traktor Kontrol S4, MIDI Control Surface for DJ from Native Instruments in the Traktor series. Product replaced by the Native Instruments Traktor Kontrol S4 mk2. Native Instruments launched a time-limited special offer for its acclaimed Traktor Kontrol S4 DJ system. Throughout the month of July, all owners of a newly registered Kontrol S4 unit are eligible for a free "Scratch Upgrade Kit", which allows users to mix and scratch with timecode control via directly connected turntables or CD decks. Combined with the unit's jog wheels, the timecode functionality are designed to give DJs independent control of all four decks of the software simultaneously. 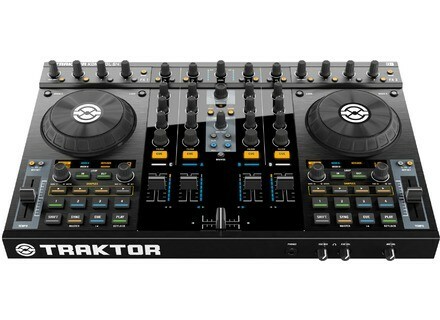 The "Scratch Upgrade Kit" includes a license for the Traktor Scratch Pro 2 software version as well as a pair of timecode vinyls and CDs, and represents an additional value of $139 / EUR 129. The special offer is valid until July 31st, and applies to Traktor Kontrol S4 units purchased from retailers or in the NI Online Shop. Additional information on this special offer is available at www.native-instruments.com/scratchspecial. Mixvibes U-Mix Remote MixVibes announces the availability of its U-Mix Remote for the iPad on Apple's AppStore. Synq Audio DMC-2000 Synq Audio announces the availability of its new control surface for DJ DMC-2000, designed to be compatible with most DJ software. Denon Summer Software Offer Denon DJ Europe is giving away copies of MixVibes Cross LE software with its DN-SC2000 hardware controller this summer.